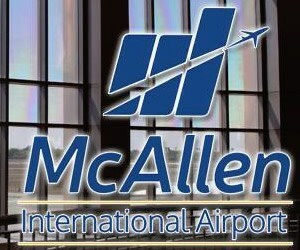 Legislation may soon be drafted that could result in the construction of a 100,000 square-foot complex, to be located in McAllen, that would provide Valley residents a new site to seek master’s and doctoral degrees currently not offered by the University of Texas-Pan American or South Texas College, according to Rep. Verónica Gonzáles, D-McAllen. The two-term lawmaker said the plan is still in the preliminary stages, but said she hopes to carry the measure in the House of Representatives, when the Texas Legislature convenes for its five-month regular session in early January. She did not provide any information regarding the sources of potential revenue for the facility and programs, noting she was scheduled to get a more detailed briefing on the plan in the coming days. However, she indicated some state funding would be involved. Gonzáles said she plans to meet on Thursday, November 20 with McAllen Mayor Richard Cortéz and other leaders from the community to get an update on the proposal. She acknowledged that she wants to serve as the primary author of the legislation. 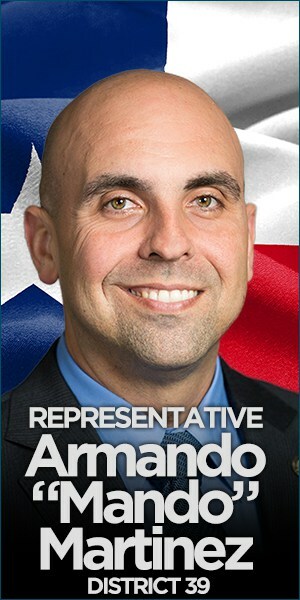 “I want to make sure first I understand exactly what we are looking for, and then I will be happy to file the legislation for it,” said the two-term lawmaker, who on November 4 was re-elected to a third two-year term as state representative for House District 41, which includes southwest Edinburg and north McAllen. 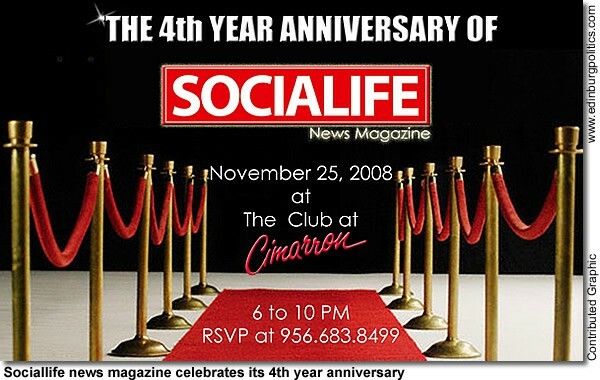 Her comments came following a legislative preview given by her, Rep. Aaron Peña, D-Edinburg, Sen. Eddie Lucio, Jr., D-Brownsville, and Congressman Henry Cuellar, D-Laredo/McAllen, during a dinner hosted on Tuesday evening, November 11, by the McAllen Hispanic Chamber of Commerce at the Club at Cimarron in Mission. 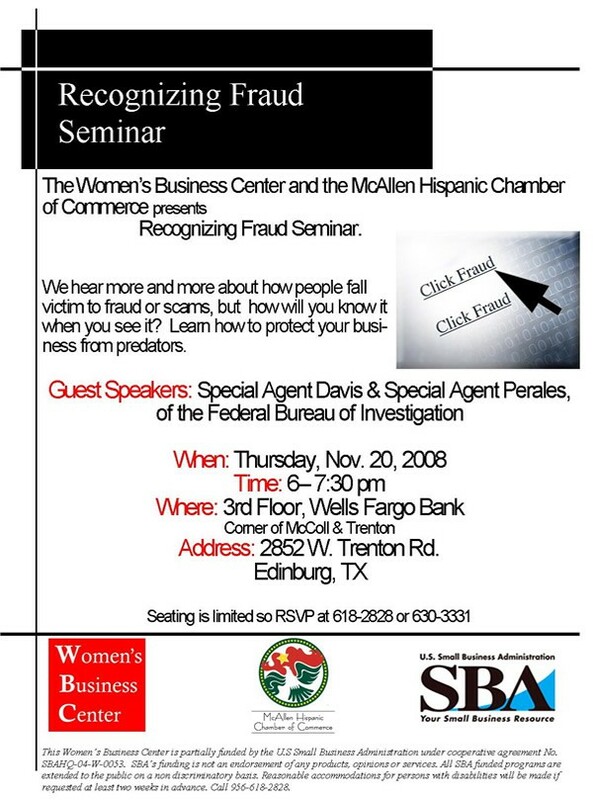 The November 11 meeting in Mission also was attended by dozens of the region’s business and political leadership, including an Edinburg delegation that included Mayor Joe Ochoa, City Manager J.J. Rodríguez, Ramiro Garza, Jr., the executive director of the Edinburg Economic Development Corporation, and Elvia López-Caballero, the city’s legislative consultant based in Austin. 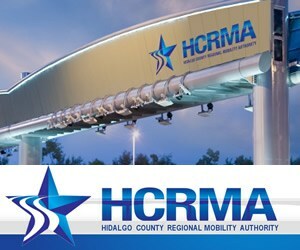 Former Hidalgo County Judge Ramón García, who serves on the board of directors for the Hidalgo County Regional Mobility Authority, and Rep. Armando “Mando” Martínez, D-Weslaco, also were in attendance for the gathering. Gonzáles said the initial plans call for the McAllen facility to offer academic programs that will focus on programs in demand by the area’s health care and trade sectors. “They will be programs that are complimentary of the industries we have here in the Rio Grande Valley,” she explained. The McAllen lawmaker predicted Sen. Juan “Chuy” Hinojosa, D-McAllen, and Lucio will guide the measure through the Senate. In addition to several STC campuses and the proposed new graduate school, McAllen is also home to the Texas A&M Health Science Center – South Texas Center, which provides health training, clinical research, medical education, community interventions and public health programs with local partners, according to school officials. Rep. Roberto Gutiérrez, D-McAllen, and Sen. Eddie Lucio, Jr., D-Brownsville, introduced the legislation during the early 1990’s that led to the creation of the Texas A&M Health Science Center – South Texas Center in McAllen. Also according to Texas A&M, the South Texas Center, which is housed in a 23,000-square-foot building located in the heart of that city’s hospital and medical corridor, was scheduled to begin offering a Master of Public Health (MPH) degree program, with an emphasis on border health, this year. UT-Pan American is the 10th largest public university in Texas, and the fifth-largest in the UT System, according to university officials. It offers 54 bachelor’s degrees programs, 50 master’s degrees programs, two doctoral programs, and one cooperative doctoral pharmacy program in conjunction with the University of Texas-Pan American. Earlier this fall, the Texas Higher Education Coordinating Board approved a new Ph.D. program at the university – a Ph.D in rehabilitation counseling set to begin in the fall of 2009. News of the postgraduate campus in McAllen comes as UT-Pan American president Dr. Blandina “Bambi” Cárdenas is scheduled to update the Edinburg community on the university’s legislative agenda that will be considered by state lawmakers in Austin. Cárdenas’ presentation will be given on Thursday, November 20, beginning at 11:30 a.m. at the ECHO Hotel and Conference Center. Her legislative preview is part of a luncheon series coordinated by the governmental affairs committee for the Edinburg Chamber of Commerce. There is a $10 fee per person to attend, with proceeds going to help cover the costs of the meal and refreshments. Historically, UT-Pan American’s legislative initiatives, from new funding for construction and additional academic programs, have also been part of the City of Edinburg’s and Edinburg Economic Development Corporation’s legislative priorities. 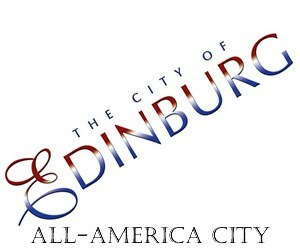 The Edinburg City Council and the EEDC, which is the jobs-creation arm of the city council, are in the process of finalizing their own legislative agendas in the coming weeks for action by state lawmakers during the upcoming five-month regular session of the Texas Legislature. The EEDC is led by a five-member governing board, appointed by the Edinburg City Council, includes Mayor Joe Ochoa; former Mayor Richard García, who serves as board president; Fred Palacios; Dr. Glenn E. Martínez, Ph.D.; and Elias Longoria, Jr.
Sen. Juan “Chuy” Hinojosa, D-McAllen, has filed bills designed to bolster consumer protections for Texans and improve the state’s building and technology standards. 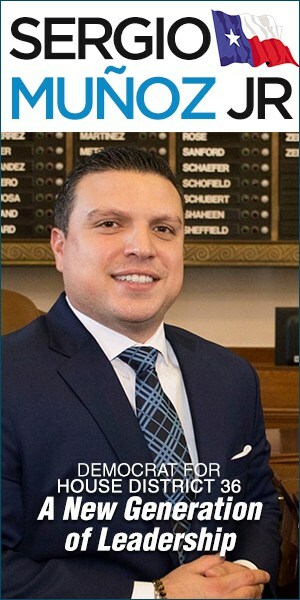 Senate Bills 264 and 265 add consumer safeguards in the insurance and electric service markets, part of an ongoing effort undertaken by Hinojosa to protect middle-class Texans during the current economic downturn. SB’s 266 and 267 seek to improve the state infrastructure and data storage technology. SB 264 requires large homeowner insurers to obtain approval from the Texas Insurance Commissioner before increasing rates. A mandatory 30-day period would be put in place to allow the commissioner time to review requests, eliminating so-called midnight rate increases that are currently filed. SB 265 prohibits electric companies from disconnecting service to low-income Texans, seniors and medically fragile Texans during the hottest summer months. 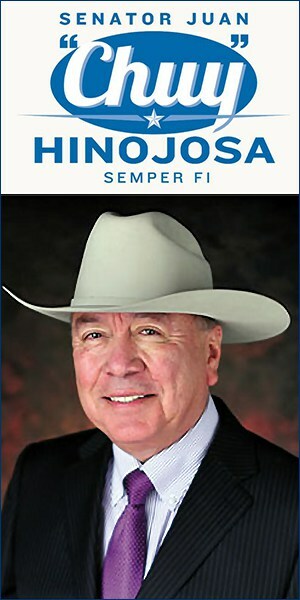 Hinojosa commented on the first two bills. The second set of bills revamps the state’s building and technology procurement guidelines. SB 266 instructs the Texas Department of Information Resources to integrate Open Document Format (ODF) – an open format for displaying, storing and editing documents – into Texas’ technology planning and procurement processes. ODF secures long-term flexibility and access to stored data, a vital part of government transparency. SB 267 requires new state buildings to meet high performance design and construction standards, reducing the operational costs of these buildings by lowering energy, waste, and water bills over the lifetime of a building. 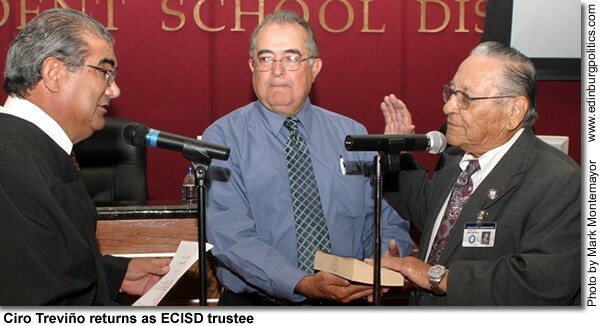 Carmen González and Ciro Treviño, reelected as ECISD Trustees for Places 6 and 7 in the November 4 general elections, on Wednesday, November 12, were sworn into office during a 6 p.m. special session of the Edinburg school board. 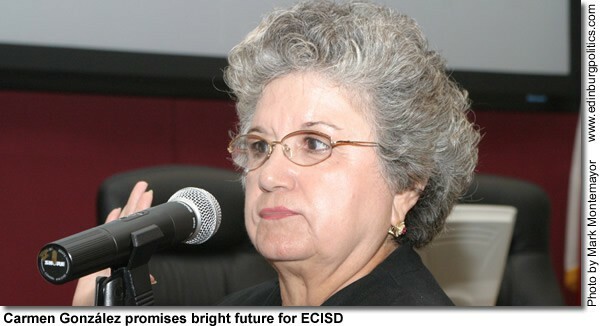 The official ceremony was in the Board Room, located on the second floor of the ECISD main administrative building. Both were elected to four-year terms. González picked up almost 60 percent of the total vote in her reelection bid against challenger – and former veteran ECISD board president – Gilbert Enríquez with 9,981 votes compared with 6,782 votes for her challenger. Treviño, who faced two challengers – Carlos Ramos and Roger C. Bunch – earned more than 55 percent of the vote, accumulating 9,648 votes, compared with Ramos’ 6,059 (almost 36 percent) and Bunch’s 1,486 (almost nine percent) turnout. It was the first campaign race for both Ramos and Bunch against Treviño, a veteran political figure in the city and Hidalgo County. The majority of the grand total votes for all five candidates were cast during the early voting period. During early voting, González received 6,520 of her 9,981 grand total, compared with Enríquez, who generated 4,671 of his 6,782 grand total during the early voting period. During early voting, Treviño received 6,132 of his 9,981 grand total, compared with Enríquez, who generated 4,671 of his 9,648 grand total. For Ramos, his early votes reached 4,222, while Bunch was able to generate 960 votes during the early voting period. After González and Treviño were sworn in, both incumbents shared their thoughts about the campaigns, and their hopes for the future of the school district. González’ match with Enríquez was the most visible, through the use hard-hitting advertisements featured in the McAllen Monitor, and personal attacks on local, anonymous blogs on the Internet. Treviño, considered by many as an icon in city and county politics – he was longtime Hidalgo County Tax Assessor-Collector – predicted the local school board would continue to do what is right for its constituents. Extending a peace offering to his two challengers and their supporters, Treviño gave them credit for running a good race. The election results were announced by ECISD Superintendent Gilberto Garza, Jr., who provided a precinct-by-precinct breakdown for absentee voting, early voting, and election day voting, plus the grand totals, during the public session, which was attended by a packed house of supporters for González and Treviño. Jaime Chavana voted against the order declaring the results of the trustee election. Trustees Robert Peña, Jr., and Greg García were not present for that vote, excused on important business. Palacios signed the certificates of election, and presented them to González and Treviño, who then read out loud the election certificates, which included the state-required oath for all elected officials that they have not promised anything of value in exchange for securing votes for their election. González was then sworn in by Justice of the Peace Mary Alice Palacios, with González’ husband, Edward, holding the Bible upon which his wife placed her hand while taking her oath of office. Treviño was sworn in by Justice of the Peace Charlie Espinoza, with Hidalgo County Tax Assessor-Collector Armando Barrera – who was Treviño’s campaign treasurer – holding the Bible upon which his friend, Treviño, place his hand while taking his oath of office. Both successful candidates received standing ovations from the audience which was present. A more detailed breakdown of the grand total votes (absentee, early, and election day voting) follows. Some voting locations had more than one precinct. A coalition of Texas border mayors, county judges and economic development associations has slammed a U.S. Customs and Border Protection (CBP) agency decision to shut Rio Grande Valley landowners out of federally-required talks over the border wall in Texas. Members of the Texas Border Coalition (TBC) also condemned a CBP decision to continue land acquisition near Roma, Rio Grande City and Los Ebanos even though the agency announced last week that it would indefinitely halt construction of moveable fencing near the communities. “TBC is dumbfounded by CBP’s continued resistance to consultation with local landowners and the community, and by CBP’s unjustifiable demands for secrecy,” Eagle Pass Mayor and TBC Chairman Chad Foster said in response to a letter from David Pagan, an agency official. A week earlier, CBP informed coalition members that construction of moveable fencing would be delayed at least until next year because the IBWC had raised concerns that the structure could increase the potential for flooding in those communities. Meanwhile, TBC and Homeland Security officials agreed in April to participate in a series of fence site tours in the Rio Grande Valley, known as “walk the line,” to help satisfy federal requirements outlined in the Consolidated Fiscal 2008 Appropriations Act. Under the law, homeland security officials are obliged to consult with the Secretary of the Interior, the Secretary of Agriculture, states, local governments, Indian tribes, and property owners in communities where the wall is to be built. The point is to minimize the barrier’s impact on Rio Grande Valley communities and residents from an environmental, cultural and economic standpoint. The coalition had hoped the tour would take place before the congressionally imposed fence construction deadline of December 31. Foster said he believes CBP officials balked because they fear effective consultation with TBC might be compromised if the agency was forced to show its hand on individual segments of fencing in the presence of opposing landowners. These fears are “inappropriately thin-skinned,” he asserted. “The idea that CBP would expressly prohibit attorneys representing landowners from walking the line when the government’s legal actions threaten the rights and liberties of landowners violates the concept of the right to counsel embodied in the Bill of Rights,” Foster said. Foster said TBC will ignore the agency’s demands and open its membership to affected Texas landowners who reside along the wall’s 270-mile path if CBP insists on shutting them – or their attorneys – out of the consultation process. “We will not retreat from our insistence that the government consult with our communities and landowners ‘to minimize the impact on the environment, culture, commerce, and quality of life’ as the law requires,” he added. 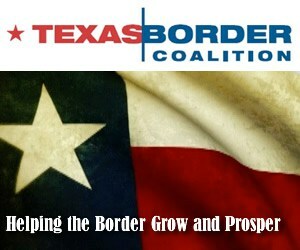 The Texas Border Coalition (TBC) is a collective voice of border mayors, county judges, economic development commissions focused on issues that affect more than 6 million people along the Texas-Mexico border region and economically disadvantaged counties from El Paso to Brownsville. TBC is working closely with the state and federal government to educate, advocate, and secure funding for transportation, immigration and ports of entry, workforce and education and health care. Lt. Gov. David Dewhurst, serving as co-chair of the Legislative Budget Board, and members of the LBB, on Friday, November 14, set the lowest Constitutional Spending Limit in state history for the 2010-2011 state budget. The LBB unanimously adopted the rate of 9.14 percent, approximately 4.55 percent per year, which is the Texas Comptroller of Public Accounts’ estimated growth rate in the state’s economy from the 2008-2009 biennium to the 2010-2011 biennium. The average rate of general revenue spending over the past three biennia is 3.5 to 4 percent per year, when adjusting for state funds the legislature appropriated for record property tax relief in the current biennium. The average rate of population and inflation growth over the same period is 5 to 5.5 percent per year. The November 14 rate adoption ensures state spending will remain well below the average rate of population and inflation growth. In no biennium shall the rate of growth of appropriations from state tax revenues not dedicated by this constitution exceed the estimated rate of growth of the state’s economy. The LBB is co-chaired by the Lt. Governor and Speaker of the House and is made up of members of the Senate and House of Representatives. The Board is required to meet and set the Constitutional Spending Limit prior to every legislative session. The 81st Legislature convenes on January 13, 2009. U.S. Sen. John Cornyn, R-Texas, on Wednesday, May 12, made the following statement regarding news reports that the Federal Reserve is refusing to make public critical information surrounding roughly $2 trillion in emergency loans from American taxpayers to troubled financial institutions. “Over the past year, the Federal Reserve has taken unprecedented action in the marketplace by providing almost $2 trillion in taxpayer-funded loans to troubled financial institutions. This is in addition to the $700 billion approved by Congress to fund the Troubled Asset Relief Program (TARP). Unfortunately, the Federal Reserve has refused to submit to even the most modest level of transparency regarding its actions. This should trouble taxpayers and policymakers alike. It certainly troubles me. “There cannot be accountability in government and in our financial institutions without transparency. Many of the financial problems we are facing today are the direct result of too much secrecy and too little accountability. “During consideration of the economic rescue bill, I made clear that my support for this critical effort hinged on stronger management, oversight and transparency. At a time when American taxpayers are being asked to provide unprecedented loans to get our economy back on track, they deserve to know how and where their money is being used. • Bloomberg News reported this week that the Federal Reserve is refusing to identify the recipients of these taxpayer-funded loans, which is in addition to the $700 billion in loans that are being made through the Troubled Asset Relief Program (TARP). Bloomberg News has requested details of the Fed lending under the U.S. Freedom of Information Act and filed a federal lawsuit November 7 seeking to force disclosure. • As a member of the Senate Budget and Judiciary Committees, Cornyn has been a leader in open government efforts. He joined with Sen. Patrick Leahy in leading the successful passage of the OPEN Government Act of 2007, making the most significant reforms to the Freedom of Information Act in more than a decade. He has also joined with Leahy in introducing the OPEN FOIA Act, which would require Congress to explicitly and clearly state its intention to provide for statutory exemptions to FOIA in new legislative proposals. The director of the Texas Department of Criminal Justice (TDCJ) on Thursday, November 13, reported that reforms passed during the 80th Legislative Session are having a positive impact on prison staffing levels. the Segovia unit, a 1,224 pre-release facility. 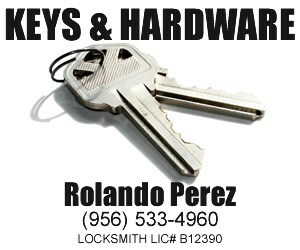 Both are located about 10 miles north of the city, near U.S. Expressway 281. The Texas Department of Criminal Justice manages offenders in state prisons, state jails and private correctional facilities that contract with TDCJ. The agency also provides funding and certain oversight of community supervision (previously known as adult probation) and is responsible for the supervision of offenders released from prison on parole or mandatory supervision. At a hearing of the Senate Criminal Justice Committee, TDCJ Director Brad Livingston testified that his agency has filled more than a thousand vacancies. He said this was accomplished through a increase in starting pay for applicants who have a college degree or an honorable discharge from the military. Money appropriated last session also included funds for a 10 percent increase for all staff in the first three levels of prison employees. Prison capacity was recently increased by converting former youth facilities in San Saba and Marlin to adult facilities. Last session the Legislature approved increasing space for probation and parole intermediate sanction facilities and drug treatment programs, but a Legislative Budget Board report shows capacity lagging behind projections. Committee Chair Sen. John Whitmire, D-Houston, was less pleased with progress relating to reentry programs, aimed at helping former prisoners reintegrate into society. He directed Livingston to redouble his efforts at improving offender reentry, including developing an ID card for former prisoners to help them find work. Committee member Sen. Juan “Chuy” Hinojosa, D-McAllen, also raised concerns about the state of care at privately operated prison and treatment facilities, saying he has heard reports that these institutions cut corners to improve profit margins, and that prisoners at these facilities are more likely to be involved in violent crimes while incarcerated. Livingston said conditions at private facilities are monitored by the state and are nearly the same as at any state run prison. He promised to deliver a report to the committee comparing rates of violent crime between public and private facilities. In addition to Whitmire and Hinojosa, the other members of the Senate Criminal Justice Committee are: Sen. Kel Seliger, R-Amarillo; Sen. John Carona, R-Dallas; Sen. Glenn Hegar, R-Katy; Sen. Rodney Ellis, D-Dallas; and Sen. Bob Deuell, R-Greenville. The Board of Regents of The University of Texas System, meeting in El Paso, unanimously approved the following motion on Wednesday, November 12, concerning The University of Texas Medical Branch at Galveston. 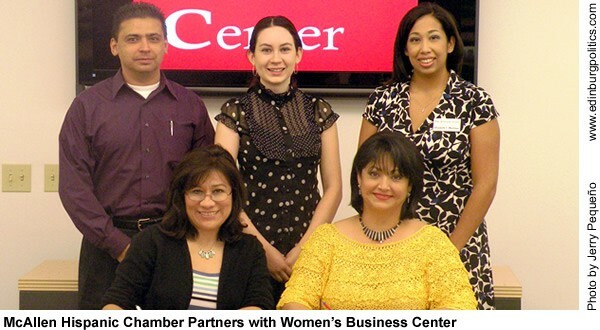 The action took place at a scheduled quarterly meeting of the board at The University of Texas at El Paso. The UT System Board of Regents cannot use Permanent University Funds, Available University Funds, or monies to be provided by the Federal Emergency Management Agency to fund operating expenses, or the payment of wages and benefits at UTMB. Therefore, as fiduciaries of UTMB and stewards of its future, with the desire to best ensure its long-term viability for its employees and the community, and in the absence of immediately available operating funds from state and local sources or philanthropy, the board finds that a financial exigency exists at UTMB and instructs the UT System to work with President Callender to implement a reduction in force of approximately 3800 full-time equivalent positions, including personnel actions discussed in Executive Session. The board further directs that steps be taken to mitigate the impact of the reduction in force on affected faculty and staff, including priority hiring of qualified employees for available positions at other UT System institutions, assistance in placement of employees with other healthcare institutions and employers, and exploration of opportunities for retirement incentive packages. In a move to quickly address the reconfiguration of the clinical enterprise at The University of Texas Medical Branch at Galveston (UTMB), the UT System has contracted a consulting firm to assist the system as plans are developed to position UTMB for future success. Atlanta-based Kurt Salmon Associates will deploy a team of experts to conduct market, facility and financial analyses of UTMB. The firm will work closely with UT System officials and UTMB with the ultimate goal of defining a successful clinical model that includes a presence on the island as the institution continues to recover from the devastation caused by Hurricane Ike. Kurt Salmon Associates is expected to complete its various analyses and report its findings and recommendations to UTMB and UT System officials by no later than the end of January. The UT System Board of Regents will then review the information and decide on a course of action. The institution will re-open up to 200 inpatient beds and an emergency room as soon as possible. A 16-bed maternity ward has already re-opened. In the wake of Hurricane Ike’s landfall on September 12, over the last two months UT System and UTMB officials have considered several options to address the financial losses and resulting financial exigency of the institution. Those management discussions resulted in a recommendation that a significant reduction in force would be necessary to ensure the long term viability of UTMB. After reviewing legal issues related to a reduction in force and individual positions to be eliminated in an executive session, the UT System Board of Regents on Nov. 12 instructed the UT System to work with UTMB President David Callender to implement the reduction in force of approximately 3,800 full-time equivalent positions recommended by UT System and UTMB. Furthermore, the Board directed that steps be taken to mitigate the impact of the reduction in force on affected faculty and staff, including priority hiring of qualified employees for available positions at other UT System institutions, assistance in placement of employees with other healthcare institutions and employers, and exploration of opportunities for retirement incentive packages. Texas Attorney General Greg Abbott on Thursday, November 13, charged Motel 6 – Harlingen and Best Western Las Palmas Inn with unlawfully increasing room rates during Hurricane Dolly. According to the state’s enforcement actions, the defendants charged excessive or exorbitant rates in an attempt to illegally profit from a declared disaster. On July 22, 2008, with Hurricane Dolly approaching the South Texas coast, Gov. Rick Perry issued a disaster declaration. As a result, federal, state and local officials urged Gulf Coast residents to evacuate certain areas as soon as possible. The Governor’s disaster declaration triggered special provisions of the Texas Deceptive Trade Practices Act which prohibit vendors from selling or leasing fuel, food, lodging, medicine or other necessities at an excessive or exorbitant rate. 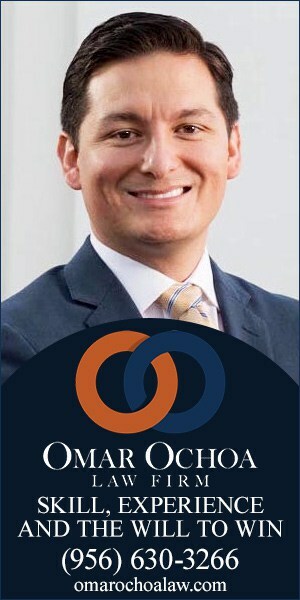 Investigators with the Office of the Attorney General (OAG) uncovered pricing data that revealed Motel 6 – Harlingen increased room charges after the disaster declaration was issued. According to the investigators’ analysis, the cost to stay in 34 of the defendant’s 49 rooms increased by 20 percent or more after a disaster was declared. Similarly, investigators revealed that Best Western Las Palmas Inn, increased rates on 43 of 44 rooms. According to court documents filed by the state, the cost of 21 of those rooms increased by 20 percent or more after the disaster declaration was issued. The OAG is seeking civil penalties of up to $20,000 per violation and up to $250,000 per violation for victims over 65. Texans who encounter price gouging should call the OAG’s consumer hotline at (800) 252-8011. Information collected is relayed directly to agency investigators. Texans may also report other disaster-related scams to the hotline, including home repair scams and charity scams. Gov. Rick Perry on Monday, November 10, announced the creation of the Texas Veterans Leadership Program (TVLP), a resource to help veterans returning from Iraq and Afghanistan assimilate to civilian life in Texas by providing employment and training services, resources and referrals. TVLP is headed by Texas Workforce Commissioner (TWC) Tom Pauken, and is modeled after the Vietnam Veterans Leadership Program. TVLP will be overseen by a state director, and will recruit 28 veterans to serve as local Veterans Resource and Referral Specialists, or liaisons in workforce centers across the state. “Veterans have made tremendous sacrifices during their service to our country, and the Texas Veterans Leadership Program is our opportunity to welcome veterans home in the right way and assist them with a successful transition,” Pauken said. Providing services to reintegrate the men and women returning from combat in Iraq and Afghanistan into civilian life is a priority for Gov. Perry. In August, he called on the Texas Legislature to provide in-state tuition to all qualified veterans, their spouses and dependents as gratitude for their service and sacrifice to our state and country. The tuition waiver could save veterans and their families up to $8,100 a year if they take 30 semester credit hours at a Texas public university. 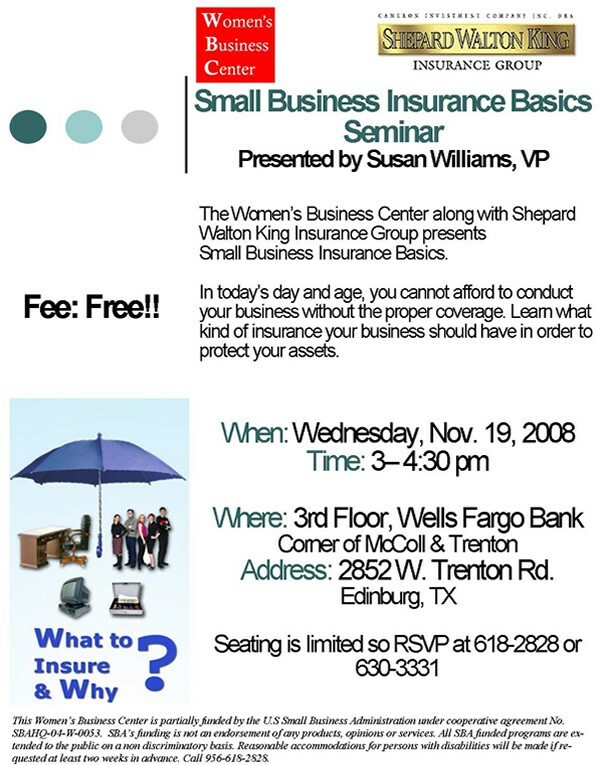 For more information on TVLP, please visit http://www.twc.state.tx.us/tvlp/tvlp.html. By SEN. EDDIE LUCIO, JR. If we want top-quality schools for our children, we should also want top-quality transportation to get them there. Take a close look at a school bus sometime. You will see something missing that I wish was there and something there that I wish was missing. What’s missing are seat belts and what’s not are polluting emissions. To keep our youngsters safe in a collision or other hazard was addressed by my bill last legislative session that requires three-point seat belts in all new school buses purchased after September 1, 2010. My quest this upcoming session is to garner support for the funding needed by our school districts so they can plan for seat belts to prevent our children from being bounced around during an accident, which can cause serious injuries or even death. The other safety hazard involves diesel engines that cause air pollution, which can be more harmful to children than adults. Young children are more susceptible to these emissions because they breathe more air per pound of body weight. Diesel exhaust contains small particles, known as fine particulate matter, or PM, that can easily pass through the nose and throat, penetrate deep into the lungs and pose serious health risks, including aggravated asthma and allergies. Some studies show a cancer link to long-term exposure. PM causes haze that restricts visibility, and also contributes to environmental and aesthetic damage. If we’ve passed regulations to reduce car and other emissions, why not reduce school bus emissions while we’re working on cleaning up our air. The Texas Commission on Environmental Quality (TCEQ) offers a solution for our school districts, and I strongly encourage participation in their program. The Texas Clean School Bus Program is designed to improve the health of school kids and bus drivers by assisting school districts in reducing diesel exhaust emissions from their school buses. This program isn’t just an attention grabber. It actually provides grants for eligible projects that reduce these emissions. TCEQ also provides education through this program about various clean school bus options that can improve the school bus fleet, thus improving the environment and human health in turn. Educating schools and the public about the potential health impacts associated with diesel bus idling, with a goal of eliminating unnecessary idling altogether, is a vital component of this holistic approach to emissions reduction. The Texas Legislature is behind this important program. My colleagues and I have attended events honoring school districts who applied for and were awarded grants so they can participate in this program. Just recently, I had the honor of speaking at Pharr-San Juan-Alamo (PSJA), where we recognized the school district for receiving $87,638 in grants to retrofit 42 of their buses. The beneficiaries of the PSJA decision to apply for the grant are not just the student riders and bus drivers, but the community as a whole. To be retrofitted, a bus must operate on a regular, daily route to and from a school and have at least five years of remaining useful life, unless the applicant agrees to remove the retrofit device at the end of the bus’s life and install the device on a different bus. Four types of retrofits are currently approved for funding. For more information on these retrofits and the program in general, you can log onto http://www.epa.gov/otag/retrofit/verif-list.htm. All public school districts and charter schools that operate one or more diesel-powered school buses can qualify for up to $250,000 per grant request to retrofit their buses, and while there are limits as to how much money can be reimbursed for each retrofit device there are no limits as to how often a school district can submit a grant request. At any rate, seat belts and emissions reduction devices are investments worth making for our children’s safety and health, plus they benefit our school bus drivers and South Texas communities to boot. The University of Texas System is currently seeking applicants for the student regent position on the UT System Board of Regents. The term for the position runs from June 1, 2009 to May 31, 2010. The nonvoting student regent is an ex-officio member on each Board committee. In addition to participating in approximately a dozen official Board meetings over the course of the appointment, the student regent frequently visits with student leaders, administrators, faculty and staff at the 15 UT institutions across the state. In 2005, the 79th Texas Legislature authorized the governor to appoint a nonvoting student regent for each public university or university system. Applicants, who must be enrolled at UT System institutions and in good academic standing, are required to fill out the UT System Application for Student Regent and the Office of the Governor Appointment Application, which must be submitted to the institution’s student government organization. Each student government organization will choose up to five applicants; the campus presidents will submit the applicants to the UT System chancellor by no later than December 15, 2008. The chancellor will recommend two or more applicants to the governor, who ultimately makes the formal appointment. 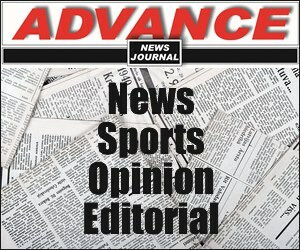 The National Association of Hispanic Journalists condemns the killing of crime reporter Armando Rodríguez of the Mexican newspaper El Diario de Juárez outside his home in Ciudad Juárez on Thursday morning, and calls on society and authorities to stand strong against the violence that seeks to silence a free press. The veteran reporter was gunned down in front of his daughter as he was preparing to take her to school. According to press accounts, the gunman walked up to his car in that city across the border from El Paso, fired, and then fled with other men in a car waiting nearby. NAHJ decries Rodríguez’ violent murder as part of the growing wave of terror by those who wish to silence the truth. According to the Committee to Protect Journalists, powerful drug cartels and escalating violence associated with criminal groups have made Mexico one of the deadliest countries for reporters worldwide. The Committee has found that since 2000, 24 journalists – including Rodríguez – have been killed, at least seven in direct reprisal for their work. Seven journalists have also disappeared in Mexico since 2005. Members of El Paso Press Club issued a statement that the assassination of an innocent colleague in their neighboring city represents a new low in a war over drugs, money and power. NAHJ joins in solidarity with reporters on both sides of the border who continue to risk their lives to chronicle the violence that is gripping Mexico and leading to greater impact on untold families in both countries. NAHJ further urges the Mexican government to investigate the violent murder of Rodríguez and other colleagues who have been killed or who have disappeared, and to recognize that an assault on the press represents an attack on Mexico’s democracy and on all of society, including segments of the United States. Ruben B. Bohuchot, the former Chief Technology Officer at the Dallas Independent School District (DISD), on Wednesday, November 12, was sentenced by U.S. District Judge Sam A. Lindsay to 11 years in federal prison, announced U.S. Attorney Richard B. Roper of the Northern District of Texas. Bohuchot, 59, of Dallas, and Frankie Logyang Wong, 46, a businessman from Houston, Texas, were convicted in July following a three-week trial on all counts of a federal indictment involving offenses related to their operation of a bribery and money laundering scheme involving DISD technology contracts. Lindsay ordered that Bohuchot surrender to the Bureau of Prisons on January 20, 2009. Wong is scheduled to be sentenced at a later date by Lindsay. Wong co-owned and was the president of Micro Systems Engineering, Inc., (MSE), a computer reseller that provided computer products and services to large corporations and school districts. 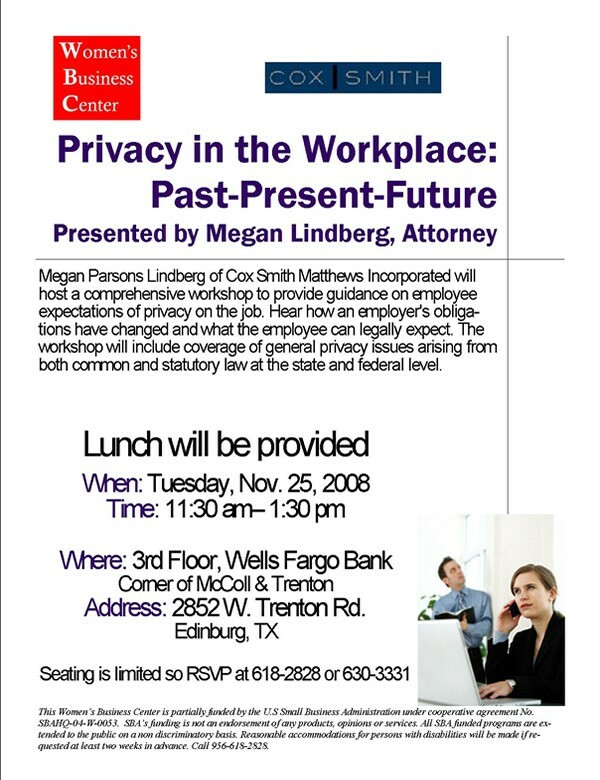 MSE was headquartered in Houston, with an office in Dallas. Bohuchot and Wong were each convicted of one count of conspiracy to commit bribery concerning a program receiving federal funds and one count of conspiracy to launder monetary instruments. In addition, both Bohuchot and Wong were convicted of eight counts of bribery concerning programs receiving federal funds, and aiding and abetting. In addition, Bohuchot was convicted on one count of obstruction of justice and two counts of making false statements on tax returns. They will have to forfeit $1,192,263.90, which represents the proceeds of the conspiracy to commit bribery and money laundering. 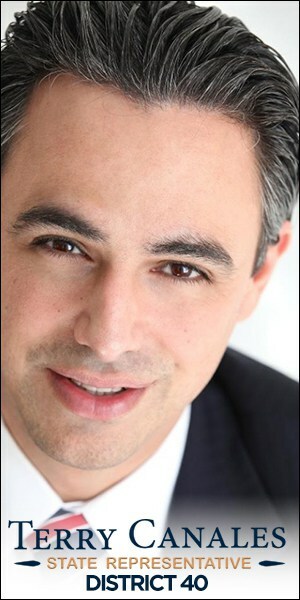 In his position as Chief Technology Officer at DISD, Bohuchot was in charge of procuring technology contracts for DISD. Bohuchot provided Wong and his company, MSE, with inside information thus enabling MSE to obtain two lucrative contracts with DISD. The two contracts involved a “Seat Management” and an “E-Rate 6” program; these two contracts were worth approximately $120 million. William Frederick Coleman, III, a friend of Bohuchot’s, was hired by Wong as a consultant to assist MSE, who partnered with Hewlett Packard (HP), in obtaining the seat management computer contract at DISD. The “Seat Management” contract was an agreement in which the school district leased desktop computers, while the vendor continued to own and be responsible for the computers’ upkeep. At the end of three years, the school district would have the option of purchasing the computers. By DISD policies, Coleman was not eligible to assist MSE as a consultant because he had worked for DISD within the previous five years and because he was paid on a contingency fee basis. Coleman, 52, formerly of Dallas, but currently residing in Detroit, Michigan, was Deputy Superintendent and Chief Operating Officer at DISD from August 30, 1999 through September 15, 2000. While at DISD, Coleman’s responsibilities included managing the purchasing department. DISD’s Purchasing Department worked with all other departments in procuring items, including computers. According to news articles in the Detroit Free Press, Coleman also recently served as the Detroit Public Schools Superintendent. Coleman pled guilty in May to one count of attempting to influence a grand jury and testified for the government at this trial. He was sentenced in September to pay a $5000 fine and serve a one-year term of probation and perform community service. In May 2002, Bohuchot, Wong, and Coleman, along with their wives, traveled to Key West, Florida at MSE’s expense. During that trip, Bohuchot brought a copy of the specifications for the upcoming “Seat Management” contract at DISD, even before DISD had issued a public Request for Proposal (RFP). Providing information relating to the upcoming contract, before the information was provided to other vendors, assisted MSE and HP in submitting a winning bid proposal to DISD. From January 27, 2003, through July 11, 2005, MSE received at least $4.4 million as a result of its participation in the DISD “Seat Management” contract. The government also presented evidence at trial related to the “E-Rate 6″ contract. The “E-Rate program was administered by the Federal Communications Commission to provide affordable telecommunications and internet services to eligible schools and libraries. “E-Rate” is funded through taxes charged to all telephone consumers. DISD was eligible to apply for “E-Rate” funds in the sixth year of this program. Ultimately, the contract that DISD obtained for “E-Rate 6,” under Bohuchot’s direction, was worth $120 million. Beginning in November 2002, MSE and other companies formed a consortium for the purpose of submitting a bid proposal relating to the “E-Rate 6” program at DISD. On December 17, 2002, DISD published the “E-Rate 6” RFP, giving public notice to all vendors. 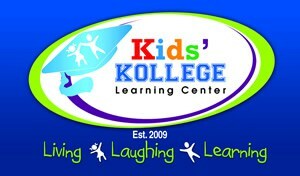 On January 20, 2003, the Consortium submitted a bid proposal which DISD ultimately approved. Funds paid to the Consortium under the “E-Rate 6” contract were received by MSE and then forwarded to Acclaim Professional Services, Inc.
Wong and others formed Acclaim in late November 2002, prior to the “E-Rate 6″ RFP being made public, to distribute “E-Rate 6″ contract funds to other Consortium members. As a result of the “E-Rate 6″ contract awarded to the Consortium, Wong personally received millions of dollars. He was an owner of MSE and Acclaim, as well as having interests in at least two other companies that were part of the Consortium. “Sir Veza” was a 46′ Post motor sport fishing yacht that was purchased for approximately $305,000. This expensive yacht was named and controlled by Bohuchot. To conceal Bohuchot’s use of this yacht, Wong created and became president of Statewide Marketing, LLC in October 2002. Testimony revealed that Wong told the full-time “Sir Veza” boat captain to keep Bohuchot happy and that if Bohuchot did not use the boat, then Wong had no use for it. After the second contract (“E-Rate 6″) was obtained, MSE, through Statewide Marketing, purchased a second, larger yacht. The evidence showed that Bohuchot named this yacht “Sir Veza II.” “Sir Veza II” was a 58′ Viking and purchased for almost $800,000. Evidence was presented that Bohuchot used “Sir Veza” I 90% of the time the boat was in use and that Bohuchot used “Sir Veza II” 80% of the time the boat was in use. All of the expenses and operating costs of these two yachts, including the boat captain’s salary, were paid by Statewide Marketing and MSE at Wong’s direction. In addition, Wong used MSE’s credit card to pay for Bohuchot’s excessive entertainment expenses. The evidence showed that from May 2002 to July 2005, Wong paid for trips to Key West, Florida, on at least five occasions for Bohuchot, Bohuchot’s family, and Bohuchot’s friends. These expenses included airline tickets, hotels, meals, boating, and other entertainment. Wong also gave cash to Bohuchot, disguising the true nature of these cash payments. Bohuchot arranged for Wong to hire Bohuchot’s son-in-law at MSE. Bohuchot then told his son-in-law that he would be receiving a second paycheck from Acclaim (for no additional work) and that some of this money would be given to Bohuchot in cash. Bohuchot’s son-in-law agreed to this arrangement, saved 40% of the money for taxes as directed by Bohuchot, and acted as a conduit to conceal regular cash payments from Wong to Bohuchot. Bohuchot failed to report the income he received from this bribery scheme on his 2004 and 2005 federal income tax returns. Bohuchot also attempted to persuade his son-in-law to testify falsely in front of the grand jury during the federal investigation of this case. Bohuchot told his son-in-law to testify that the cash payments were repayments for living expenses. Bohuchot’s son-in-law testified in the trial that he did not testify as Bohuchot requested and that the true nature of the cash payments Bohuchot received were from Wong, not any repayment by the son-in-law. In addition to concealing payments to Bohuchot, Wong also used his administrative assistant as a conduit to conceal cash to himself. Wong’s assistant testified that Wong directed approximately $1 million to her over three years. She testified that she saved 40 percent for taxes, at Wong’s direction, and then split the remainder of the money with Wong, which she gave to Wong in cash. Both defendants concealed payments to themselves by diverting payments through others. U.S. Attorney Roper praised the investigative efforts of the FBI, the Department of Education, the Internal Revenue Service – Criminal Investigation and the Anti-Trust Division of the Department of Justice. Assistant U.S. 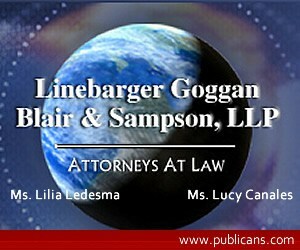 Attorneys Dayle Elieson and Linda Groves, and Special Assistant U.S. Attorney Jennifer Bray prosecuted the case.